We would like to introduce you to our new E-Tag Option. Customers will be able to top up and manage their account online. The average household disposes of 25kg of weight on a fortnightly basis, on the condition they are managing their waste accordingly. Different rates will apply for different bins and so the more you recycle the more money you will save! Check out What goes in my bin? to ensure you are recycling correctly. The purpose of this option is to encourage more households and business to manage their waste more efficiently. Its aim is to promote a better segregation of waste and thus reduce the amount of waste entering the landfills. This system will allow customers to determine their collection costs. You can check your weights by logging into your account using your account number(found on the back of your bin) . How will I track my bins? 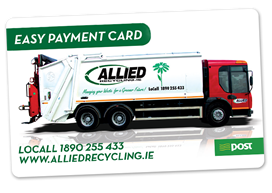 Our fleet of vehicles have state of the technology which allows your bins to be recorded to your account. By logging onto our website you are able to track your bins. All technology is checked on a regular basic by National Standards and Technology Authority of Ireland. Where can I top-up my account? Your account can be topped up in your Local Post Office, Pay Zone and on our website. Charges may apply. The minimum top-up amount is €20. Your bins will be chipped so that they can be assigned to your account. You can log onto the website with the PIN number to see your current statement.